Dual Channel 12G-SDI to LC Fiber converter. 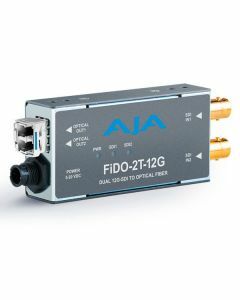 Explore how AJA’s latest 12G-SDI solutions can simplify production and post workflows, providing ample bandwidth to handle high resolution, high frame rate and deep color content over a single cable. Learn more about our FiDO 12G-SDI/optical fiber Mini-Converters,12GDA distribution amplifier, 12GM Muxer/DeMuxer, FS-HDR converter/frame synchronizer and Io 4K Plus Thunderbolt™ 3-equipped audio and video I/O device with 12G-SDI support.